One of the things I've enjoyed the most is getting to "know" other artists around the world through reading their blogs and exchanging comments. Even more fun is exchanging actual goodies. There's something extremely touching about receiving a true treasure in the mail from someone you've never met, but whose work you admire and blog you faithfully follow. 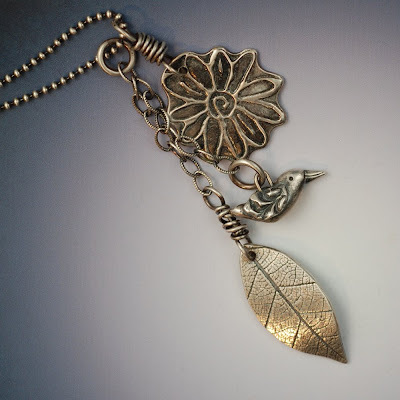 I had the experience of being a lucky recipient for a giveaway on HappyDayArt, a metal clay blog by Catherine Witherell. This energetic artist gave away ten or a dozen separate pieces one week, and I was lucky enough to win this gorgeous pendant (really three pendants in one!). I vowed that I would give it a try from the giver side, and this week I'm going to do just that. 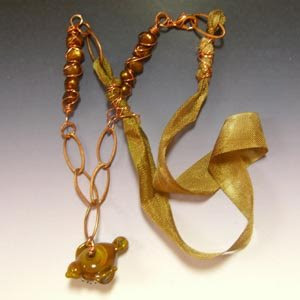 Up for grabs is this caramel hollow bird pendant strung with copper, pearls, and ribbon. So drop a note in my comments to be entered into the drawing. On Friday, I'll announce the winner. I'm working on getting photos of a few more treasures to find new homes for, so stay tuned. What a beautiful pendant you received. I so admire your work, I am a metal artist who is totally now taken time off of metal work to learn how to work with glass/enamels. I also think this might lead me further into glass art...as I so love color. I am having fun playing and who knows what will come out of it.